Some of the most sought-after vacation getaways just happen to be destination weddings because they’re not only exciting for you, but for your guests as well. For that one-of-a-kind experience where you can get that relaxing feeling with the highest level of exclusive all-inclusive amenities, and the world’s most beautiful beaches, Sandals Resorts has you covered. 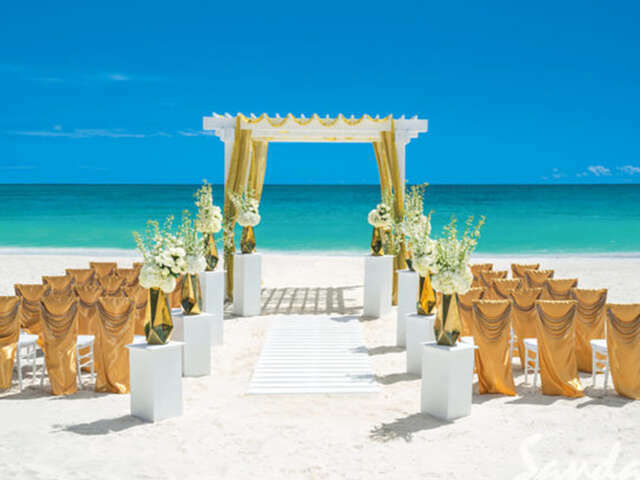 When you’re ready to tie the knot, Sandals Resorts will help you do it in style with an expert team of professional planners who will take care of every detail and make your special day unforgettable. The following are the top five Sandals Resorts that provide wedding packages. From planning the ceremony to getting your honeymoon or family moon started, these destinations are the stuff of dreams. When you’ve travelled far to say “I do,” you’ll quickly realize that this isn’t just any beach wedding. Life-long memories will also take shape away from the aisle. Sandals offers over-the-water private butler villas complete with infinity pool, private offshore island and the benefit of staying at one resort, with access to two other Sandals Resorts. If the idea of a resort located within a 500-acre nature preserve with a two-mile long beachfront, ocean views almost everywhere you look, over-the-water chapel, bungalows, and bar sounds divine, then Sandals South Coast is where you need to be. The luxury of choice is what you’ll have here. A high-end suite that will feel like a personal oasis. When the ceremony is over you or your guests won’t have to look far for things to do. There a two world-class golf courses, and an inviting half-mile crescent-shaped beach on this 220-acre estate resort. You’ll also enjoy access to two other Sandals Resorts. Did someone say Family Moon? This family-friendly resort is a must-book when it comes to either a wedding joining two families, or a wedding celebration with many relatives in attendance. A seven-mile beach is here for all to see and enjoy, as well as a waterpark, and a lot of other activities for kids of all ages. The romance of your wedding will go beautifully with a wide variety of pre-wedding and post-ceremony entertainment and activities. Be sure to take full advantage of the impeccably maintained Maxwell Beach, and the benefit of access to one other Sandals Resort. Here, wedding and honeymoon come together in one breathtaking location. There are only two words left to say when you’re thinking about booking your wedding at Sandals Resorts: I do.